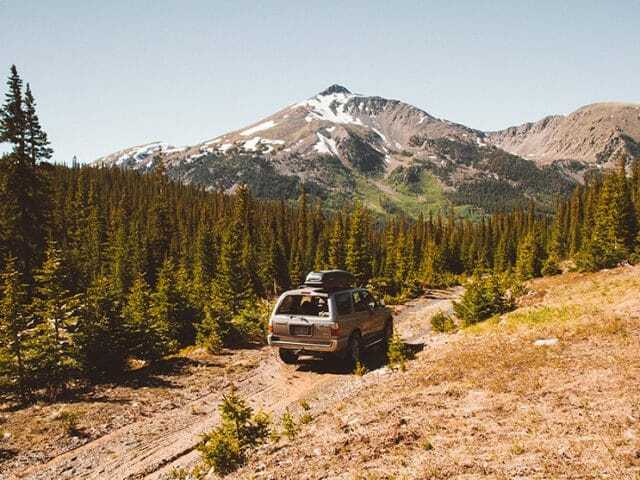 The tent camping game has been forever changed by the introduction of three types of specialized truck and SUV tents: ground attachment, truck bed, and rooftop tents. You’ve probably seen these tents at your favorite campground. They attach directly to the vehicle and utilize the car as part of the camping shelter. 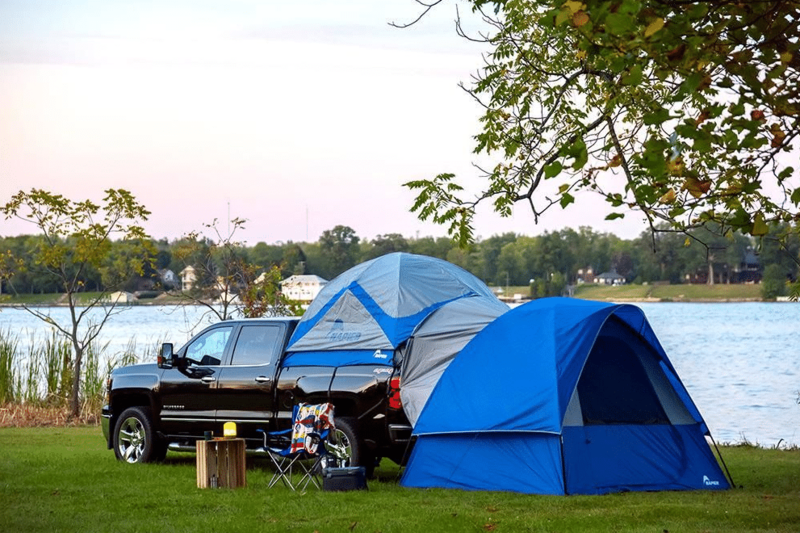 If you drive a truck or SUV, it’s time to consider taking your camping setup to the next level with one of these three tents. Each has its own advantages and disadvantages that will help you decide which one is right for you. Ground attachment tents are the most similar to standard ground tents. They’re made of the same polyester fabric, and use similar lightweight poles and hubs to erect the tent. Just like standalone dome tents, attachment tents allow you to fully stand up inside and come with a rain fly or canopy. One wall is removable and can be wrapped around your hatchback or SUV, allowing you to utilize the entire cargo space for storage or sleeping. Many ground attachment tents can be converted into a standalone ground tent by reattaching the wall. Ground attachment tents are the most cost-effective way to break into car camping, starting at around $200. They are lightweight and easy to set up with just one person. An adjustable sleeve allows for a custom fit to your vehicle. You don’t have to take it down when you want to drive somewhere. 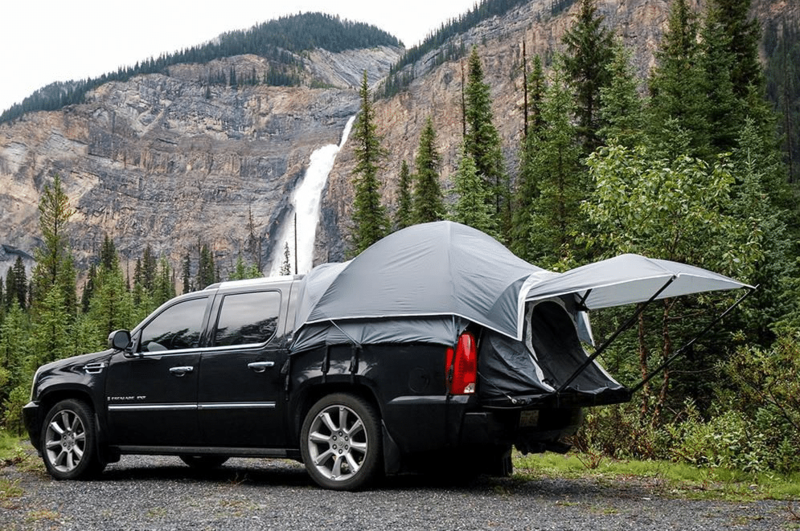 Just unstrap it from your car, reattach the removable wall, and convert it to a standalone tent. You can fully utilize your trunk or cargo area for storage or extra sleeping room without worrying about rain or bugs getting into your car. These are the most spacious of the SUV and truck tents, with room for four people in the tent and two more in your SUV. Because there are no ladders or tailgates to climb, they are easiest to set up and get into, no matter your physical ability. They’re also the easiest to use with children and pets. Special ground attachments can be linked to an existing truck bed tent, providing even more room for your family. Ground attachment tents face many of the same problems as standard tents, including being more exposed to the elements and wildlife. With such a large footprint, it can be difficult to find level ground for both the vehicle and the tent. Traditional tent poles and hubs take longer to set up and break down than a pop-up or fold-out tent. You have to pack additional bedding, padding, and tarps since you’re still sleeping on the ground. These tents work better with SUVs and hatchbacks and tend to fit poorly on pickup trucks. Truck bed tents are the answer for people looking for a budget-friendly way to avoid sleeping on the ground. They pop open inside your truck bed, allowing you to use the truck bed as a sleeping platform. Some truck bed tents don’t have a bottom, while others do. Truck bed tents come in several sizes and can be used with long or short beds. They attach to your bed rails or strap into your fender wells. Truck bed tents are a great entry-level tent if you’re just getting into truck camping. They’re accessible for the average camper, starting at around $200. These tents weigh in at just 8-10 pounds and take up very little cargo room. Your truck’s tiny footprint allows you to set up anywhere you can drive. There are no ladders or overhangs to worry about. You still maintain a height advantage with protection from ground elements. The sides of your truck bed shelter your sleeping area from wind and wildlife. As opposed to a rooftop tent, you can take the tent down after every trip. This is a great option if you’re camping with your daily driver and don’t want to commit to installing a heavy tent that’s difficult to remove. The biggest disadvantage of truck bed tents is that you can’t use your truck bed while camping. 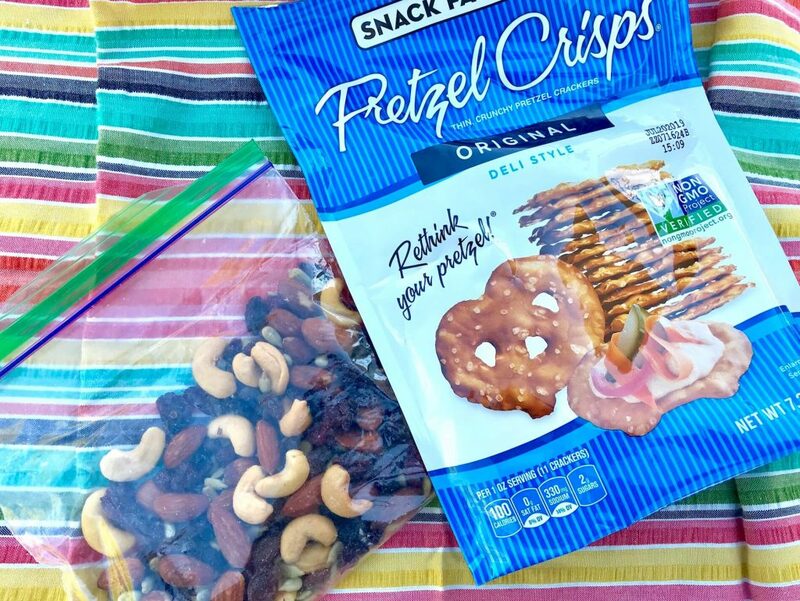 You have to unload all your gear, coolers, and equipment before you can go to sleep, which can be inconvenient if you arrive at your campsite at night. You’re still just as susceptible to the wind and rain as in a ground tent. You may also have to deal with water pooling inside your truck bed – and in your tent – during a bad storm. Truck bed tents come in a few standard sizes, but they are not guaranteed to be a perfect fit. They are usually not adjustable. They can only be used with a pickup truck. If you trade or sell your truck, you won’t be able to use your tent anymore. You’ll need to buy a bed mat for your truck for comfort purposes. 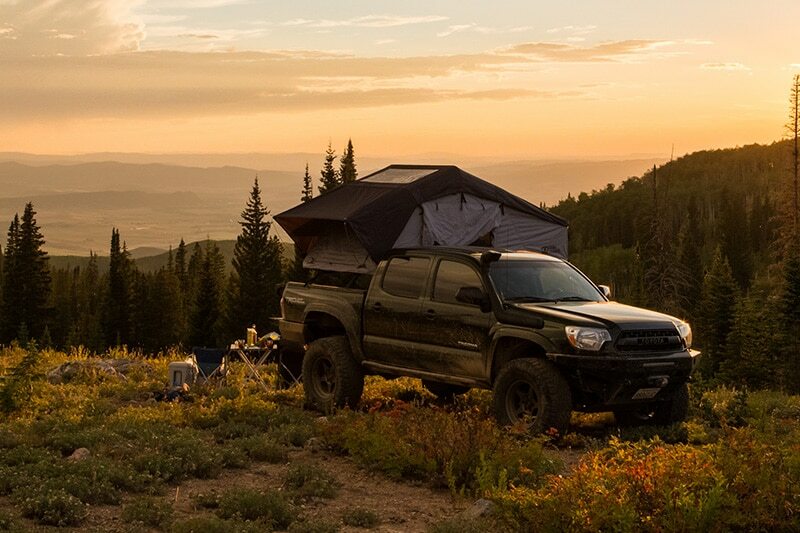 Rooftop tents are the biggest trend in truck camping and overlanding right now. They’ve been around for decades in Africa and Australia, but have gained a massive following in the US recently, largely due to social media. There are dozens of rooftop tent brands, all of which have unique selling points and features. Soft side rooftop tents are typically made from canvas, while hard-shell tents are made out of fiberglass, plastic, or aluminum. Rooftop tents work on both trucks and SUVs. They’re installed on top of a roof rack and require climbing a ladder to get inside. Most rooftop tents fit two people comfortably. With a rooftop tent, you can camp anywhere. 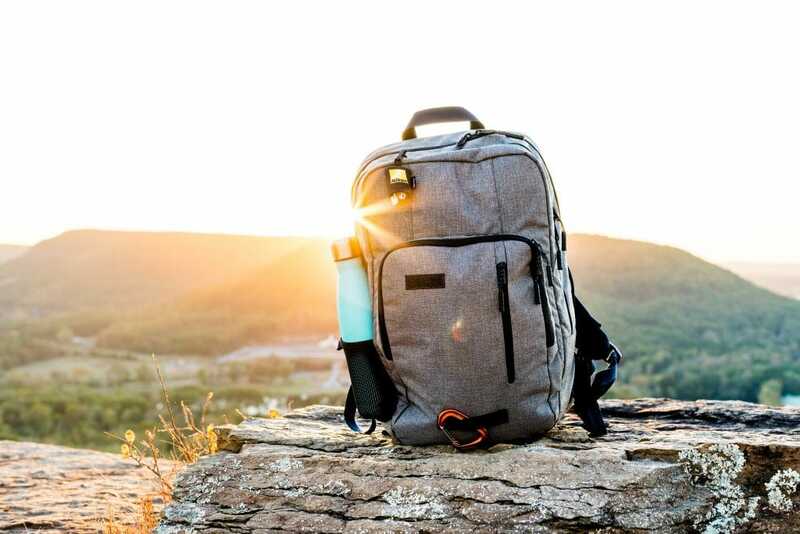 They’re great for overland adventurers who enjoy seeing the world from a higher perspective. 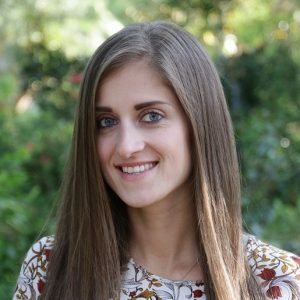 Their flat sleeping surfaces come with a built-in mattress, allowing you to leave the bedding inside the tent. They’re made from canvas, which is a more durable, thicker material than the fabric used in ground tents. Canvas offers more protection from the elements. You still have full use of your truck bed for storage, and don’t have to unload anything to set up your sleeping quarters. 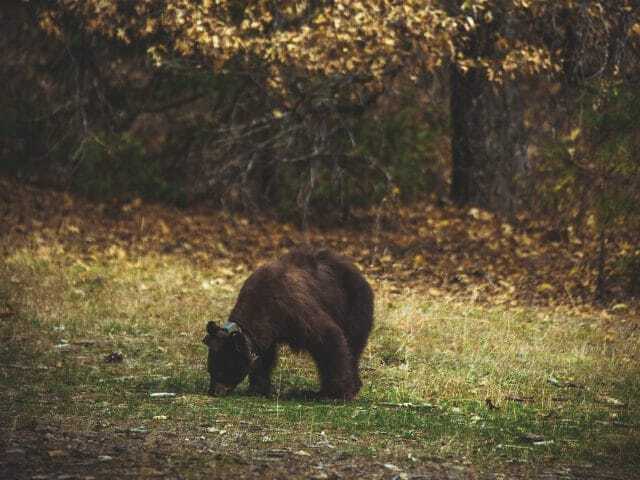 Being elevated above your vehicle provides the ultimate safety from bears and other animals. You’re also protected from human hazards, especially when camping in rowdier places. You can camp on uneven ground in a rooftop tent. Just place a wedge under your tires to level out your camping surface. They’re easy to set up and take down. Everything is self-contained when folded up. The biggest disadvantage of rooftop tents is that their features come at a lofty price. The least expensive tents start at around $800 for a base model. 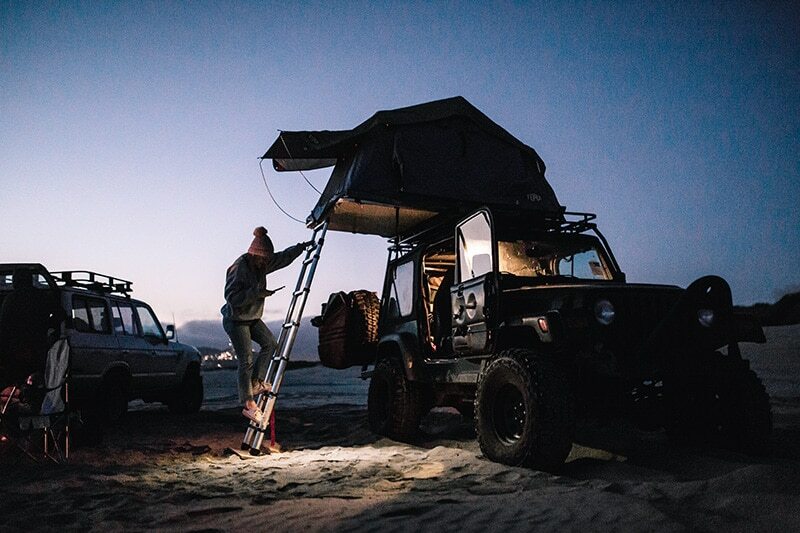 Add in the cost of a canopy, awning, ladder extenders, or simply a larger sleeping area, and you can find yourself spending thousands on a camping setup. You have to install a roof rack or a bed rack that can support the weight of the tent and campers. For a high-quality rack, expect to spend at least $500. They’re heavy, averaging around 100 pounds. You need at least two people to install a rooftop tent, and you may not want to remove it once you do. Many people end up leaving the tent permanently installed on their roofs. This increases the wear-and-tear on the tent and hurts your fuel economy. If you’re exploring in your vehicle, you have to take the tent down every time you leave the campground and put it back up at night. You have to climb a ladder to get in and out of the tent. 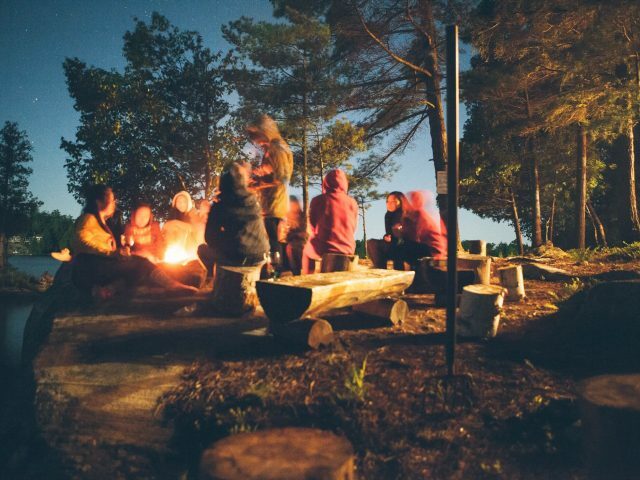 This can be challenging if you have physical limitations, children, pets, or enjoyed a few too many beers around the campfire. Buying a specialized truck or SUV tent is an easy decision to make. The hard part is choosing the right one. 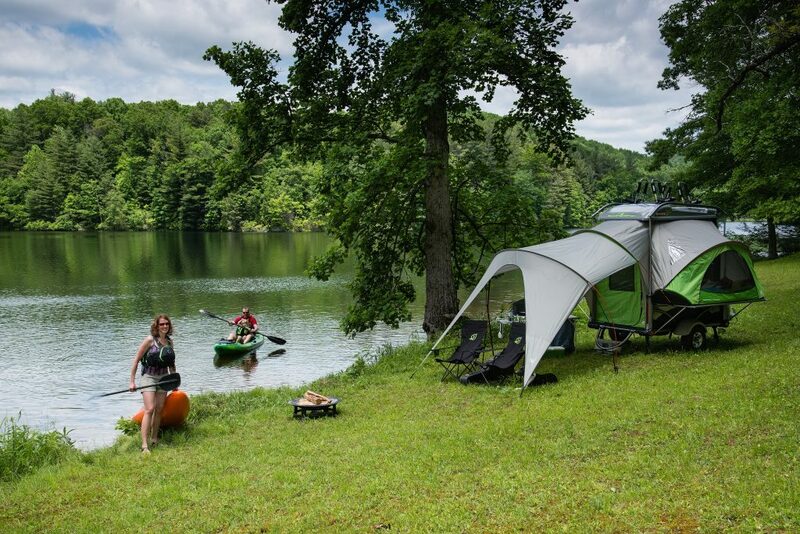 There are so many distinct benefits to each type of tent, and you really have to consider which suits your camping needs the most. Leave us a comment and let us know what’s most important to you in a camping setup, or which tent you decide to go with. Amazing Spring Camping Destinations Across the U.S.